Such hope is here, that in Jesus, any one of us can put off the Old Self (for me, the Old Erin) with its self-centered ways and put on the New Self (the New Erin, the True Erin) that was “created after the likeness of God in true righteousness and holiness.” As I mentioned in my 2017 theme post, living like the True Me wasn’t going to happen in a mere 365 days. It’s a transformational process, a dawning—it’s a becoming of the True Erin that God has redeemed in full even though the fullness is unfolding one day at a time. I cannot recommend these books enough. Get yourself the set, and chew on them for 2018. And then, let’s chat! Tending my heart was a challenge this year. I often felt overwhelmed, swamped with responsibilities and work, and discouraged with my inability to find traction in my schedule. The end result? Accepting to a greater degree God’s grace for me, a finite creature who over-commits (then can’t make it all fit), can’t seem to return phone messages (please text me for speedier replies), wants to do everything (I’m such a dreamer), and messes up a lot (kudos to friends and family for extending forgiveness). Learning to apply and rest in God’s promised grace is a good lesson, to be sure. I forced myself a few times to put aside the pressures (and extending deadlines) in order to choose solitude and slowness. Choosing to guard my heart in this way was a reminder that life doesn’t happen to me; I have a measure of agency that’s for me to employ. Tending my heart is my responsibility. Something that was good for my heart was celebrating 25 years of marriage to Mike. My family hosted a dinner out for us, and it was a sweet time of remembering the love and care we’ve shared over the years. What a gift! Reading is a respite for me, and I did plenty of it in 2017. I read 40-plus books; some are still in progress, others are half-read. Check out my 2017 reading list over at Goodreads for a full list of titles. An unexpected jolt for my brain (and arguably my heart and soul too) was seeing the Broadway show Hamilton in Chicago. It was utterly moving. Although a bit cliche, I did want to lose a bit of weight in 2017. I lost it, but then I found about half of it again toward the end of the year. oops. Another body-related goal was clearing out my clothes, which I hadn’t done in several years. I’m a terrible shopper and my closet is an odd mish-mash of style. I did a sort and purge, which was rather invigorating. I think I need to do another round soon because I don’t miss what I donated, and I have more that I am simply not wearing—seems silly to hang onto them. I wanted to start a regular date night with Mike, but for some reason, this childless couple can’t seem to make a regular evening out happen. But one has miraculously appeared, all on its own: almost every Saturday morning we go to The Coffee Hound for coffee and pastries. We chat, hang out, coordinate calendars for the week ahead, talk about work projects, and just be together. It’s wonderful! Another date that’s been maybe a 50/50 success rate is a monthly coffee with my mom and sister. I love the space to catch up with them and hope to keep that rolling into 2018. My work was all kinds of exhilarating in 2017. My goals included the release of my book, increasing my consulting load, and monthly writing. My book, Comfort Detox, released in February; this resulted in lots of radio and podcast interviews, a speaking engagement (Peoria, Illinois), a women’s retreat (Indianapolis, Indiana), and several published support articles. Goal accomplished! As managing editor for Christ and Pop Culture, I get to work with ultra-talented writers, producing content via the site, digital magazine, and podcast network. Persuasion, my podcast with Hannah Anderson, is still going strong. My consulting work continues as well—I have several clients providing me with steady work in marketing communications and editing. 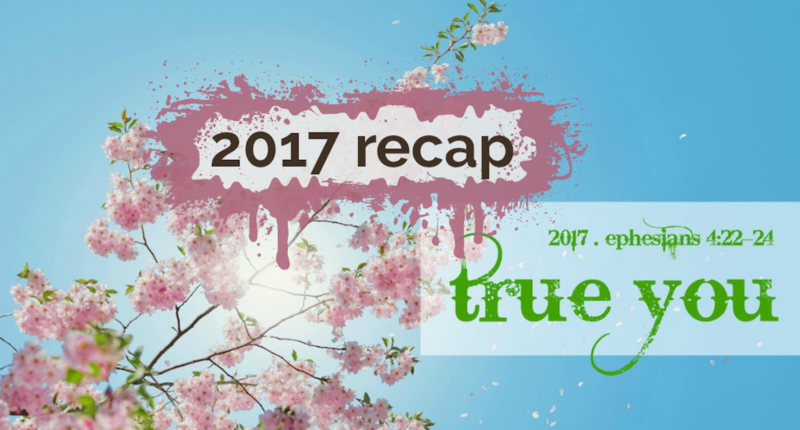 I do wish I had written more regularly, but 2017 turned out to be a year of supporting the writing I had already completed, so I needed to embrace that reality rather than be frustrated with it. There’s always next year, right?! For fun, I participated in the Write 31 Days challenge, writing a post every day in October (almost); my series was titled Wake up from Zombie-Like Faith. Because of the intensity of my workload in 2017, I’ve not been able to put much attention toward our home. Mike has carried this load almost in full. We did complete some home maintenance and improvements, and I did do some de-cluttering (which is needed again already). I had hoped to start tracking my monthly expenses, but that never happened. I had big ideas for finding a place to volunteer and another place to be more involved in my church, but that simply didn’t happen. In a round-about way, my work with Christ and Pop Culture is an investment in society, but it’s indirect… which is why I had hoped to have more one-on-one involvement. Maybe in 2018? Or maybe that’s for another season.